Black Cohosh has an effect similar to the female hormone estrogen, which governs the menstrual cycle and declines after menopause. The herb was long used by Native Americans as a remedy for painful menstrual periods. It also has an anti-inflammatory, sedative effect. The medicinal part of the plant is the root, both fresh and dried. Generations of American women have relied on the gnarled root of black cohosh(Cimicifuga racemosa) to relieve various "female problems," from PMS and menstrual cramps to menopausal symptoms including the most troublesome one, hot flashes. An American wildflower, a member of the buttercup family, it has been recommended as an alternative to standard hormone replacement therapy(HRT) when a women deals with hot flashes and sweats. As estrogen levels decline in a woman's body during middle age, she may experience hot flashes, sweats, vaginal dryness, depression, and other unpleasant symptoms. Black cohosh has in many women offset this by providing powerful plant compounds called phytoestrogens that mimic the hormone's effects. These phytoestrogens bind to hormone receptors in the uterus, breast, and other part of the body, lessening hot flashes, sweats, vaginal dryness, headache, dizziness, depressive mood, and other hormone related symptoms as a result. Some women take black cohosh for hot flashes and all the other symptoms associated with menopause as an alternative to hormone replacement therapy. Unlike HRT, which has been linked to a increased risk of breast cancer, heart attacks, strokes, blood clots when taken, black cohosh doesn't appear to stimulate the growth of breast tumors, and has not shown to have any of the other negative effects of synthetic hormone replacement. Some researchers even think the phytoestrogens might prevent tumor growth by keeping the body's own estrogen from locking onto breast cells. Black cohosh has antispasmodic properties that may lessen menstrual discomforts. In addition, by possibly increasing blood flow to the uterus, it reduces the intensity of particularly painful cramps. By stabilizing hormone levels, the herb's phytoestrogens has to be of benefit with premenstrual syndrome(PMS). Take 1-2 black cohosh capsules twice daily. You may reduce to 1 to 2 capsules daily once your symptoms have improved. PMS Symptoms: Begin regimen a week to 10 days before your period. You can use black cohosh at any time of day, but to reduce the chance of stomach upset,which can occur in 2-3 %of women take it with meals. Allow up to eight weeks to see benefits for menopausal problems. Black cohosh may decrease the effectiveness of birth control. Until more information is available, Black Cohosh is best avoided by women with estrogen-dependent tumors such as breast cancer. Black Cohosh should not be used by women going through cancer treatment. There is some evidence that it may interfere with anti-cancer drugs. Black cohosh cimicifuga racemosa extract) extract (standardized to provide 2.5% triterpene glycosides) (highest quality )250 mg.
Soy isoflavones are phytochemicals (naturally occurring plant chemicals) in soy products. Some isoflavones, such as genistein and daidzein, exert mild estrogenic effects and are thus called phytoestrogens. Structurally similar to estrogen, soy isoflavones have the capacity to bind to empty estrogen receptors and relieve hormonally based symptoms of menopause such as hot flashes. Contains both progesterone and phytoestrogens which work together to provide women more effective control of their menopausal symptoms. Phytoestrogens have been shown to subdue menopause symptoms by exerting a weak estrogen like response. Contains Red Clove, Chaste Tree Berry, Black Cohosh, Dong Quai, Natural vitamin E and many other known helpful herbs. 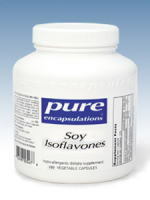 Soy Isoflavones are phytoestrogens that help to reduce hot flashes, night sweats, mood swings, depression, insomnia and incontinence.